They still figure heavily in major research today, but you are free to admit that it was the freakish nature of this beast that fascinated (and still fascinates) us. If you’ve ever had someone look at you like you had two heads, then you can relate to the meek little planarian. What is less known is that Planarians are actually very common members of our local aquatic community (and by that I don’t mean the YMCA). There are thousands of different kinds and few of them are actually called Planaria. That is a genus name of one particular group that has become a general term to cover the whole group of flatworms called Turbellarians. They go by names such as Dugesia, Girardia, and Schmidtea but we commoners just call them Planaria and we “is o.k. wid dat.” Should I say this amongst a group of flatworm scientists I would undoubtedly be looked at as if I had two heads. So, why you ask do I bring this up? Well, I encountered a whole school of tubellarians the other day in a small drainage outlet. 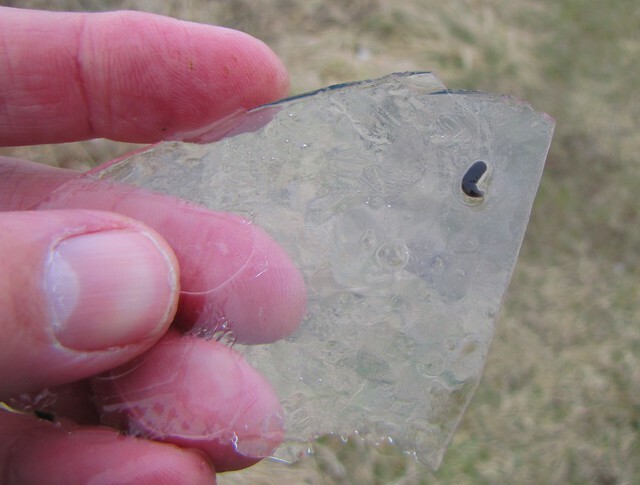 A thin sheet of ice covered the slowly flowing water and the flatworms were crawling about the bottom as if it were a balmy summer day. I bent down to get a better look and spotted at least a dozen at or near the opening of the drain pipe. It is not unusual to spot one or two, but to see a whole bunch of them in the middle of winter is worthy of note. I here, therefore, note. I wanted to get an even better look and decided to de-glove and plunge my hand into the icy water to get one. They retracted into a ball up upon being touched. Using a piece of the fractured ice, I was able to convince one to drift up and re-attach to its surface. It adhered to the ice after I brought it out of the water. 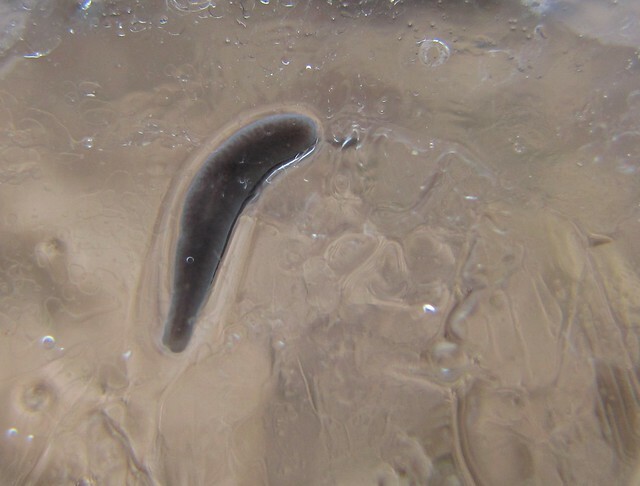 A planarian on ice is a remarkable sight for two reasons. First of all, you can notice the basic body plan of these ditch worms. 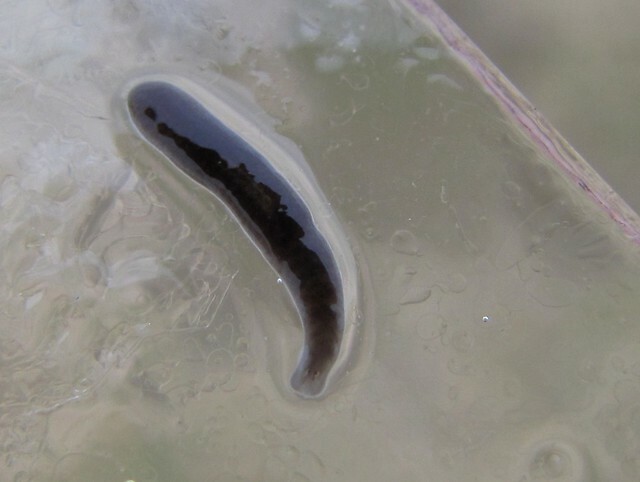 Many planarians have an arrow-shaped head with two side projections called auricles (they are not ears but look as if they could be). This type had a rounded head with a cleft palate. Look closely and you’ll see the trademark cross-eyed look of all planarians (see detail here). These are photo-receptive cells called ocelli and for all intents and purposes they are eyes (again, I am getting that look for those scientists!). The under view – as seen through the ice sheet (see below) – reveals a lighter spot located past the half-way point on the body which is actually the tubular mouth. These creatures feed on rotten meat, diatoms, and other invertebrates using this mouth. The other remarkable feature in this case was that this fleshy watery creature didn’t freeze solid out in the crisp winter air. The planarian moved about on the ice as if it were a mere leaf or rock. It skated about on a layer of mucus and I assume this mucus, combined with a hefty internal dose of anti-freeze, is what kept this example mobile and care-free. I, on the other hand, was getting very cold. My exposed and ice-dipped fingers were beginning to lose their feeling, so I had to plunk the cross-eyed creature back into the drink and give my hands the blower treatment. How incredible it is that the fine little things of nature are so very tough in so many ways. 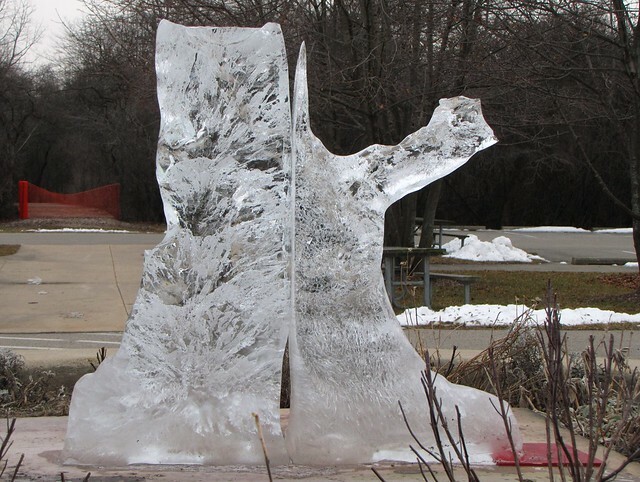 I do not count ice sculpting as one of my better skills, but I find myself performing it once a year as part of the Erie Ice Daze Festival at the Marshlands Museum. I am annually faced with the task of turning two conjoined blocks of carving ice into a single work of art. Armed only with an electric chainsaw and a wood chisel, I seek to turn a large expensive chunk of ice into something other than a smaller expensive block of ice. My anxiety is heightened because I have to perform this task in front of on-lookers and within a set period of time. My product has to be recognizable (“what is it?” is my worst nightmare question). Even though I often yearned to do some artsy Picasso-esque sculpture or a detailed carving of a Euglena, I always end up with easily identified products such as a swan, a deer, an eagle, an owl, a muskrat, and a squirrel to name a few. My giant muskrat pushed the envelope a bit because folks insisted on calling it a beaver (I guess the idea of a giant muskrat is hard to take). I grew tired of pointing out the narrow tail and, with exaggerated pride, proudly declared it to be a whale just to see their reaction. This year I was threatening to do a piece called “ice blocks.” Up until the morning of the event I was frighteningly close to actually doing as I threatened. I had no idea what I was going to do. In fact, I was thinking of doing a whale up until a few minutes before carving commenced. I ended up making a free-form gnarled tree trunk this year and I am o.k. with it (see above and here). 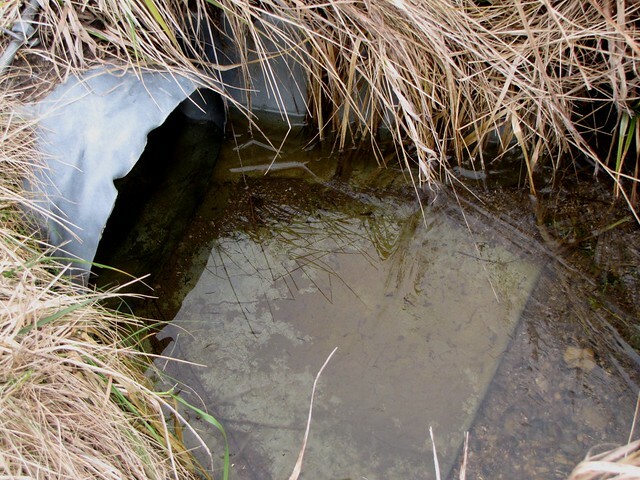 The completed product benefited from a few days of deep chill temperatures and lasted through the weekend. Almost everyone knew what it was, although some wondered why it was. They asked why I didn’t carve the figure of an owl or “something” on one of the branches, but I told them that this was a tree for tree’s sake and nothing can improve it. The interplay of rough bark, twisted form, and stately ancient grandeur – I continued – was nature at its best. Receiving back blank stares after that Ann Arbor type reply, I then told them it was a whale and asked them if they liked it. Perhaps because of my impassioned defense of trees, the Norway Maple directly across the walk began to weep tears of sweet joy. A cluster of long “sugar sickles” artfully cascaded from an old broken branch wound. The tip of each sickle held a liquid drop even though the temperature was well below freezing (kept in liquid form due to its high sugar content). It was very early in the season for a sugar sickle, which is why I attribute my weakly executed ice tree for prompting the real tree to pour forth. 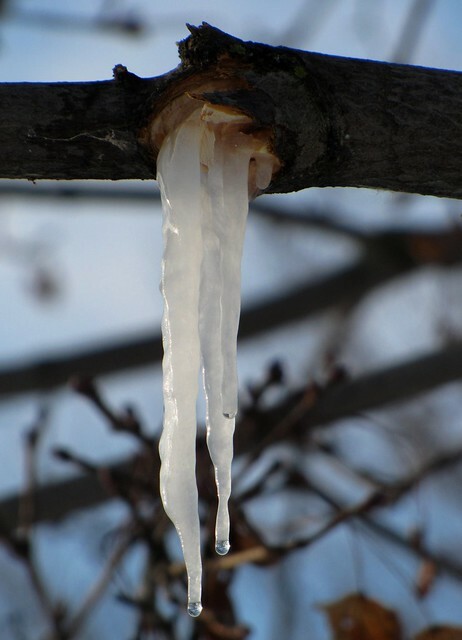 Normally these tree sickles don’t form until late February when the maples start to call up their sap reserves and maple syrup enthusiasts start boring holes. I suppose it could have been the abnormally warm weather at the beginning of the week that prompted this outpouring, but the artist in me is resistant to that explanation (it is, after all far too logical). I have heard plenty of stories about January sap runs in the past. Let it be said that I did not NOTICE this sugar sickle until after I had completed my carving, however. “There go hoc, property hoc” I say with splintered Latin (with mercy buckets to those who recognize the intended phrase). Seeing the wonderful icy lines of the Maple sickle did invoke a bit of internal artist envy. I crudely imitated nature with my chainsaw gyrations and thought myself lucky for achieving a stick creation of a stick. This maple tree, working with spit and the chill breath of Mother Nature, created a work of natural art that shamed my efforts. 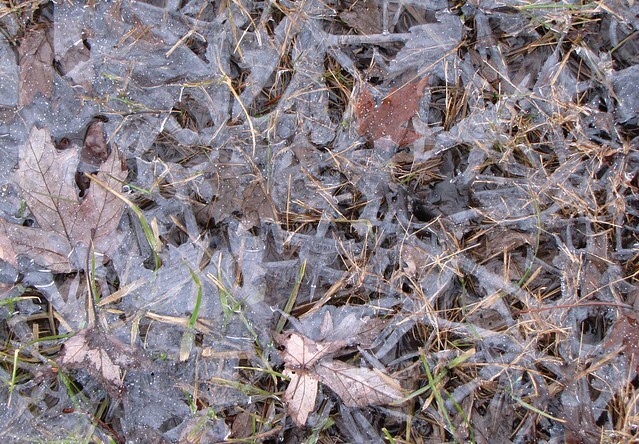 I then began to look around at other ice formations and realized the same thing. 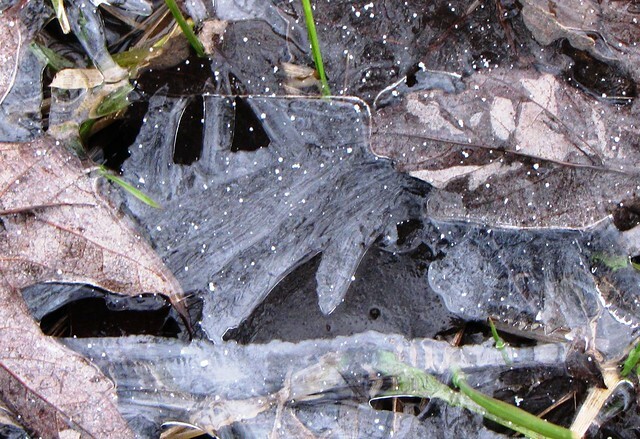 The interlocked fingers of puddle ice are endless variations on a crystalline theme. Their structure is suspended over the grass as a gravity-defying sculpture. I could go on, but I won’t. My tree will not last long now that warmer temperatures have returned. 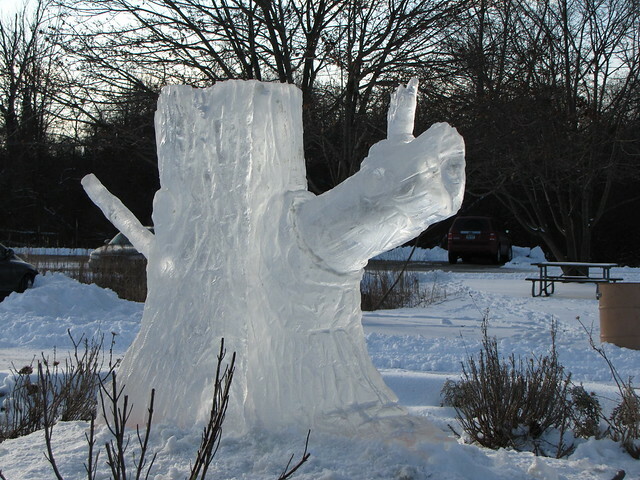 All ice sculptures – both master and amateur works – will melt away. It was with some gratitude, then, that I noticed how nature is putting a few creative touches on my ice stump as it returns to a liquid state. The sun and wind are slowly turning it into a Picasso-esque piece. I am perfectly happy to let the master ice sculptor have her way. I saw aliens fighting the other day. A statement like that might seem a bit suspect, but please don’t start backing away. I will not follow up by declaring that the aliens were fighting over the opportunity to probe me. No, these were real aliens – as in “non-native” – plants going at it with gusto. The fight was neither epic nor particularly dynamic, however. In fact, this fight was in such extreme slow motion that it could easily be mistaken as wood sculpture. The combatants were a Smooth Buckthorn and an Oriental Bittersweet. They were so tightly intertwined that their flesh was nearly one. The good news is that at least one of them will die when this is done. In the best case scenario they both die. 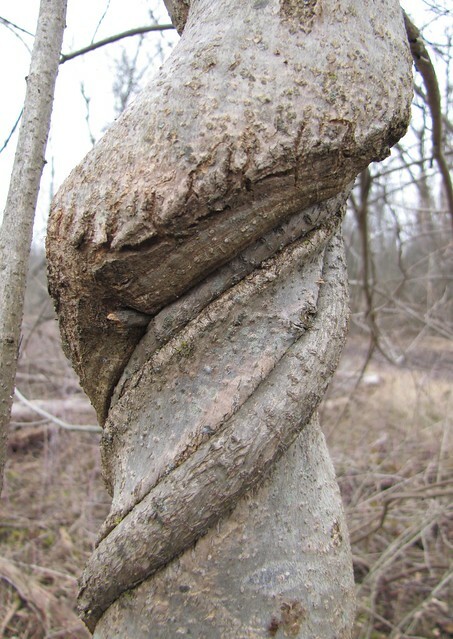 Either way, we are presented with a metaphor in this mingling of woods: two bad plants attempting to strangle each other in their quest to squeeze out the native flora. To be completely fair about it, the Bittersweet vine in this scenario is the more aggressive of the two aggressors. This is the one entangling the “innocent” Buckthorn in its selfish mission to reach the sun. This is what they do – to great excess and success (often pulling down lesser trees through sheer weight). There are two kinds of Bittersweet to be found in the Midwest. 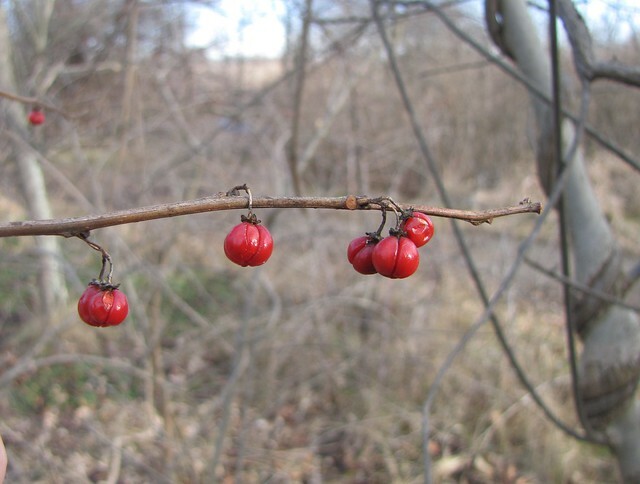 As you might have guessed, the American Bittersweet is the native and the Oriental type is the invader originating from Eastern Asia. Since the 1860’s they have been advancing westward and pushing the native variety out of the way. In short they are better at being Bittersweets than the American Bittersweets. The strangling victim here is not a plant that needs any pity. It too is an alien hailing from Europe. There are two different kinds of Buckthorn here in the Midwest and both have boldly taken over our native woods. These shrubby trees grow so densely in some spots that they form impenetrable thickets and they out-compete other native plants for precious water, sunlight, and nutrient resources. They choke out rivals through starvation rather than entwinement. Perhaps their only endearing factor is that birds will eat the berries (even though they may not “like” them). It is likely that the Bittersweet has already won this particular battle already. You can see that the vine has cut deeply into the Buckthorn’s bark (see below and detail here) . The water and nutrient flow of the Buckthorn is cut-off as if the Bittersweet had taken an axe and girdled it. It is at the “agh…eck…eek” stage of strangulation. 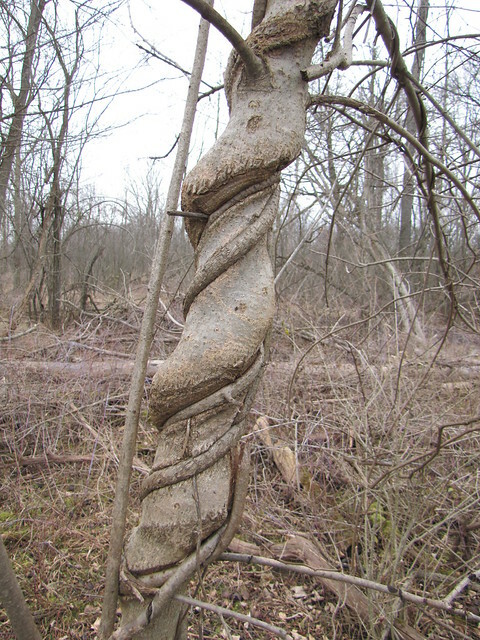 The conquering vine will dance on the bones of the dead tree for many years to come. The surrounding buckthorns will probably get their revenge, however, as they strive to shade out the Bittersweet and deprive it of sustenance. Thus the aliens duke it out here on earth and we home-soil mortals are often reduced to mere observers in the process. * *American Bittersweets have orange capsules and slightly larger berries than the Oriental Bittersweets which have yellow capsules. These capsules tend to fall off as winter advances, so this is not the best of traits. One look at the placement of the fruits will immediately separate the two: Americans produce a cluster of berries at the end of each stem, whereas the aliens produce small clusters that are equally spaced along the stem. This pictured plant is definitely the alien species. This has been a public service announcement. Thank you. There is an ancient story about how the west wind was born on the back of a she-owl. Her name was Bubo, the Queen of something or other and she was going to die or have some sort of minor operation and… Unfortunately, I don’t remember the rest. What is a she-owl anyway? Female owls are hens as far as I know. Anyway, I was meaning to introduce this piece with an intriguing folkloric literary device to connect the subject of wind and owls, but I obviously failed. Let’s just start over and forget this ever happened. Wind and owls don’t get along especially well. This has long been known. When a stiff breeze travels through the branches it sets up a moaning “hoo, hoo, hoo” sound that goes on all day. The owls are more than a bit jealous over this competitive “hooting.” They have to wait until the wind dies down at night to do their hooting. 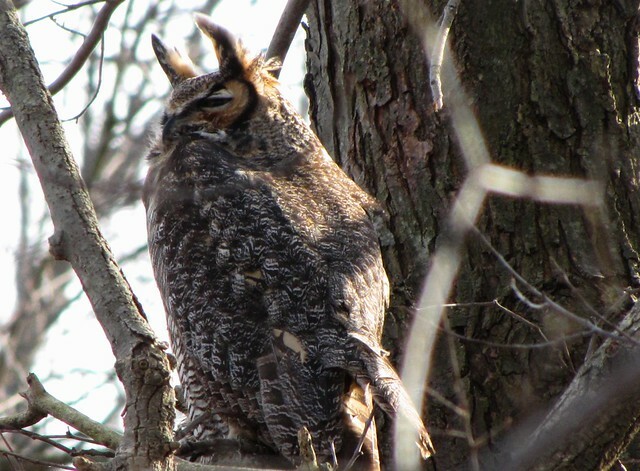 On windy nights they have to remain silent and run the risk of a sudden fatal “hoot” attack. No…wait a minute, this isn’t working either. It has never been proven that owls are capable of jealousy. They do die of starvation, car strikes, gunshots, arrows, and farmer guns but never from over-hooting. Please allow me one more try. 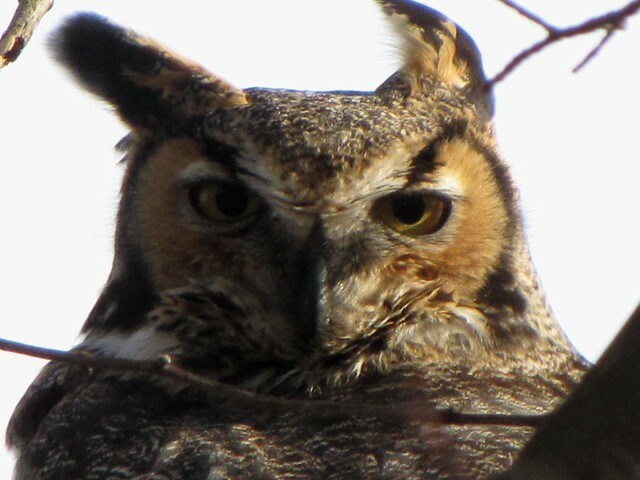 I came upon an indignant Great Horned Owl sitting on a dead branch one recent January afternoon. (Hey, this sounds better already). It was a very blustery day. By all rights, given the time of year and all, the stiff breeze should have been bitter and cutting but it was uncharacteristically balmy. I had just emerged out of the brush with all the subtlety of a wounded elephant – panting from the effort and even a little bit sweaty. I was in the process of “taking the path yet unmade,” and in the process of regretting it, when I suddenly realized that an owl was gazing down on me. (O.K., we’re good…you can relax now). The bird was uncharacteristically calm and did not attempt to fly away. I’m sure he heard me coming from a mile away and could easily have slipped away as owls are wont to do. After giving me the stink eye, this character simply closed his eyes and resumed his resting stance. At least it was intended to be a resting stance but looked to be anything but restful. His position was on an exposed branch immediately adjacent to a Cottonwood trunk. Had the wind been a south one, the perch would have shielded him well. Because the wind was issuing from the west, however, it was wreaking havoc with his style. It was buffeting him from behind and pushing up his horns to an extreme extent. The edge of his facial disc was flaring out as each gust passed through. Back feathers were parting like the Red Sea. In spite of all bold attempts to maintain composure, this owl was losing his battle for dignity. 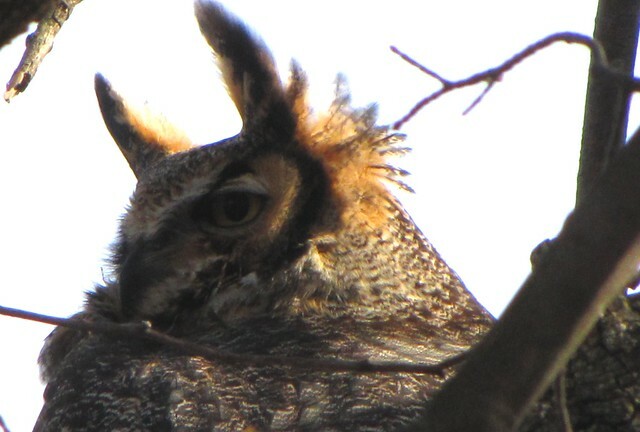 Great Horned Owls do not have horns, of course, so please excuse my use of the term in the previous paragraph (while you are at it please excuse my first two paragraphs as well). They are not ears either. The ear openings are located at the side behind the facial disc. These structures are merely ornamental feather tufts projecting off the top of the head. Their owners can operate them at will in order to express anger, fear, romance, or jealousy …oops, let’s forget the jealousy part, since that has not been proven. On this day the wind was having its way with them. 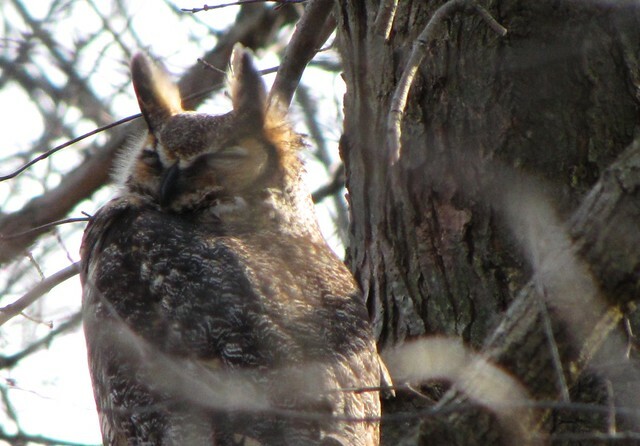 It is not hard to see why Great Horned Owls are called what they are. Them is some devilish looking points my man (or is it my he-owl). This bird is a probably a male, given his small stature and stubborn demeanor, so my “he” references are not arbitrary. His mate is in the vicinity, but she has the better sense to stick to thicker cover on such a day. Together they form the so-called “marsh owl” pair (dubbed by yours truly) that have nested in Cottonwood cavities in the nearby marsh for many years. The nesting season is only a few weeks away now, and the birds are getting ready to raise another crop of owlets. CONTENT WARNING: This blog contains little if any real content. Please do not read it if you have anything else to do (such as clipping toenails or removing ear hairs) or while awake. I was forced by the blinking prompter on the computer screen to type the following words, so for God’s sake don’t judge me too harshly. 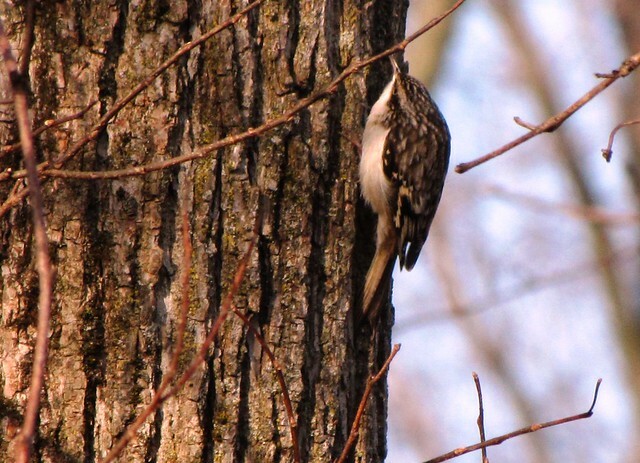 You see, I encountered a Brown Creeper the other day and felt compelled to write about it. Actually I should say that I encountered yet another Brown Creeper because the little birds are all over the place this winter. Unfortunately the subject didn’t seem big enough to warrant much space given recent events. If you are a regular nature blog reader you might have seen all the recent accounts of flocks (4 or 5) of Snowy Owls around the Lake St. Clair shore or the majestic looking Great Gray Owl staying just over the Detroit River in Ontario. Neither of these accounts will be found in my nature blog because I didn’t see any of these magnificent northern visitors. 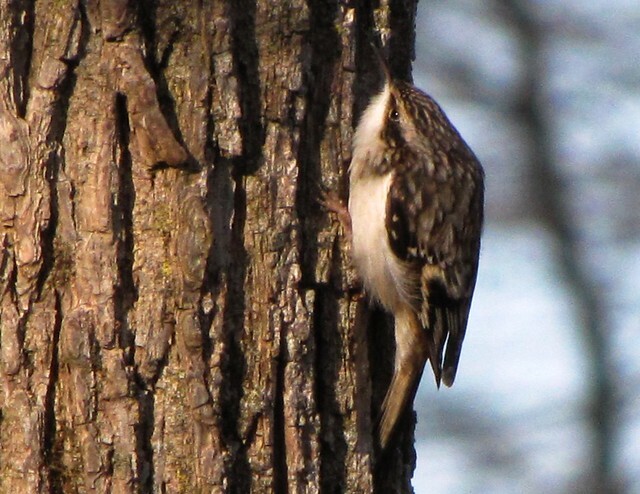 No, I saw another Brown Creeper. The sight of a Creeper is hardly inspiring. Every time I see one, however, I am challenged (by myself) to get a decent picture of one. You could say I am inspired to act beyond reason when in the presence of a Creeper. I’m not sure what a good Creeper picture will achieve (“look at my Brown Creeper shot everyone- it isn’t it magnificent. It’s so much more interesting than joe smoe’s perfectly detailed Great Gray Owl portrait!”). Yet, because these tiny creepy birds are hard to “shoot” by a minor photographer such as myself, I am strangely drawn to the attempt. Not only are they in constant motion, but they blend completely into their backgrounds. They also have bad postures. Their hunchbacked manner gives them the appearance of a clot of dirt stuck onto the bark. All of this is feeds the fires of inadequacy on my part. I have taken so many bad creeper shots over the years that I considered declaring them worthless turd-shaped birds unworthy of any effort. I would both swear off them and swear at them. I could invest in one of those thermos sized lenses (the kind that require a back brace and a six foot clearance )and get a shot worthy of the cover of L.B.B. Digest, but that will not happen due to my religious convictions. Still, they tempt me like small satanic contra-angels. When this latest Creeper popped into view, I held back for at least 30 seconds. It was a beautiful sunny morning and the bird was close, but I would not be lured. I would just observe it. Defying the normal Creeper pattern, this creature lingered and actually remained still for a few seconds at a time as it picked unseen delicacies from the walnut tree bark. Like a dam giving way to a flood, I instantly decided to “unsheathe” my camera and shoot away. The result? Several more mediocre shots and a commitment to post something about them. Enter factual sequence: Brown Creepers, mousy birds only 5 inches in length, are the only members of their tribe in North America. Equipped with long sickle-shaped bills, Creepers slink (aka “creep”) up tree trunks from bottom to top and probe for insects, spiders, and spider egg cases. Like woodpeckers they use their stiff tail feathers as props, but a Creeper’s tail is much longer in proportion to the body than those of the ‘pecker clan. Their call, a nearly inaudible series of high-pitched “see see see” notes, defies the hearing abilities of people of a certain age. Enter dream sequence: For some reason I experienced a flashing day-dream sequence while watching the Creeper. In it I became the Creeper. I was still a full sized human in this vision. So, after an uncomfortable panting accent up the trunk I decided to pause and search for insects. Not being equipped with a pair of forceps for a bill, I resorted to the using my fingers to pry away at a loose piece of bark. I made the mistake of looking down as I followed the path of the detached bark to the ground and experienced an uncontrollable episode of sphincter tightening. My hands were no longer engaged in hanging on and, lacking any tail support, I began a rapid wingless descent to the ground. I followed the same general direction as the bark, but due to my mass, my route was much more direct. Lying still and hump-backed on the ground I uttered a string nearly inaudible of notes. “Help me,” I droned like a helium balloon leaking air. End of dream sequence. If this posting had been about a Great Gray Owl or a Snowy Owl, I would never have needed to share my vision with you. 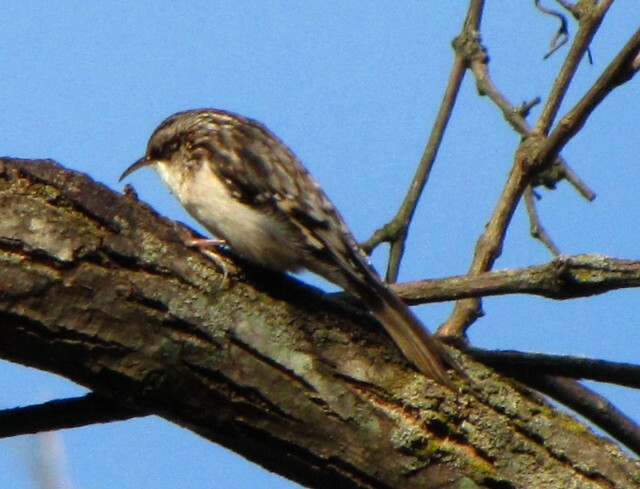 It is about a Brown Creeper, however, and it is what it is. There are hundreds of birds out there that qualify as creatures of only passing interest. To birders they are list items, worthy of a check mark, but quickly relegated to L.B.B. status (as in Little Brown Bird) by most of us. Most of these category candidates are un-spectacular when put into a comparative world occupied by Bald Eagles, Sandhill Cranes, and jewel-like Hummingbirds. Members of the Sparrow clan often head this bland list because they small, brownish, and behaviorally unspectacular. Very few people have T-shirts featuring sparrow images on them. I chose to say “very few” in place of the word “none” in the previous sentence because just as I am sure that there are people with pictures of pseudo-scorpions on their T-shirts, I know there are die-hard sparrowphiles with embroidered sparrows on their bill caps. Even though I personally like sparrows, I am guilty of ignoring them as well as the next person. This fact is true even though I know there is no such thing as a plain “sparrow” and that my ignorance is just that – ignorance. Like any other group sparrows come in many different forms and are equipped with varied talents. Among songsters, for instance, the bold declarations of the Lincoln’s Sparrow are un-matched and the rich rufous hues of the Fox Sparrow are “handsome” in comparison to any fowl. But the truth is that all sparrows are little and, even though their hues vary from near red to near black, they are basically brown. Their lifestyles are equally brown – secretive and slinky. I am writing this blog entry to prove that even L.B.B. sparrows have something to offer (call it the weakest of my New Year’s resolutions). 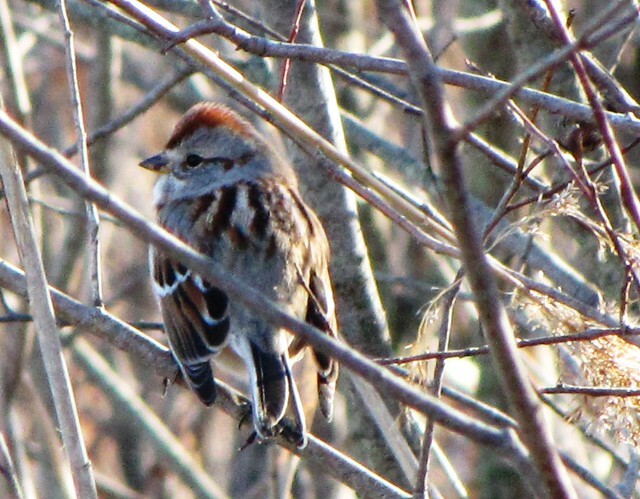 On a recent walk at Crosswinds Marsh I was handed a random example in the form of a Swamp Sparrow. True to form, the bird came and went – melting into the browness after pausing only a few seconds for a few hasty portrait shots. O.K., I said, this will do. It would be a cop-out to spend the rest of this space simply describing the beautiful subtle shades of this bird, but we should pay some attention to this. All sparrows have attractively patterned backs with streaks of cream interspersed with dark and red-brown, and this species is no exception. Perhaps the most attractive features on the winter version of the Swamp Sparrow are the clear gray cheeks and orangish head stripes. The breast is plain and un-speckled. Here in the upper mid-west, the breeding and the wintering ranges of these sparrows overlap, so we are as likely to see the grayish winter birds as well as the browner summer ones (am I overusing the word brown here?). A trait that does not appear obvious in my portrait, but is crucial to the species, are the legs. Certainly all legs are crucial (needless to say), but those of the Swamp Sparrow are slightly longer than other closely related species. They use these longer legs to wade into shallow water in order to pick out invertebrates for food. They will even stick their heads under the water surface to achieve their foraging task if necessary. They are masters of all manner of wetland habitats from swamps and marshlands to sedge meadows and bogs. During the winter they resort to foraging for seeds in these same habitats. Thus (need to say) they are called Swamp Sparrows. It is always fun to look at scientific names whenever one is running out of fascinating things to say (not that I am, but let’s be real here). The official name of the Swamp Sparrow is Melospiza georgiana (Latham). This basically means “the song finch from Georgia.” At first this seems totally inappropriate, but it makes sense. Melospiza, the genus name, is a combination of the Greek words for melody and finch. There are three species in this genus (Lincoln’s, Song, and Swamp Sparrows) and collectively they are called song sparrows. The species name, georgiana, comes from the fact that the first described specimen of this bird originated from the state of Georgia. The 50 year old English naturalist, who named the thing in 1790, never set foot in Georgia or North America for that matter. His name was John Latham. A physician by profession and a naturalist by choice, Latham was a productive “bird namer.” One of his surviving portraits apparently shows him as a 10 year old child with a bird on his hand, so he was definitely a bird guy from the get-go. In some circles he is known as the “Grandfather of Australian Ornithology.” Among the many Aussie species he named, crossword enthusiasts around the world can thank him for naming the Emu. I guess this would also make him the grandfather of crosswords as well. Why he is not called the “Father of Australian Ornithology” must indicate that he never actually went to Australia either (a guess on my part). Perhaps the “Cousin twice removed of Australian Ornithology” was already taken. 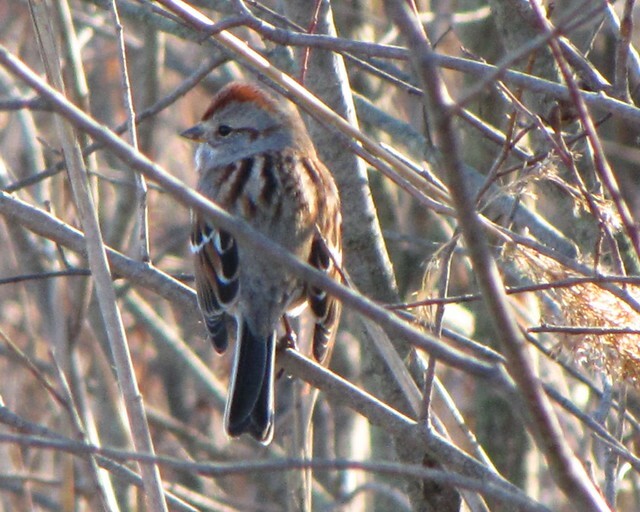 It can be safely said that the Swamp Sparrow specimen that crossed the naming desk of Mr. Latham over two hundred years ago was a winter migrant. This is the only way a Swamp Sparrow would have been in Georgia. So, the original specimen would have looked very similar to our pictured individual – a grayish brown bird. It is also safe to say that I have gone over my L.B.B. word limit and can thank Mr. Latham, and my new year’s resolution, for that.